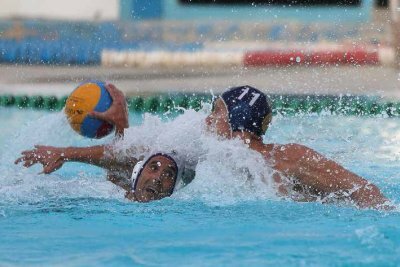 For water polo we turned again to Malta, this time with Domenic Aquilina. In Malta, soccer is the winter sport and water polo the summer sport. 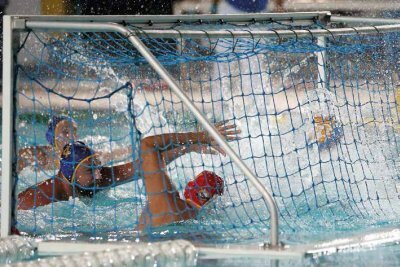 Considering its population of around 400,000 (less than either Manchester, Liverpool or Edinburgh), Malta punches well above its weight in European water polo (where Hungary are top dogs). Judging by photographs of the events and the size of the crowds, it is very popular and members Aquilina, Zammit Cutajar and Zammit Lupi can be seen in the photographers' enclosures quite frequently. As offical European Pressphoto Agency stringer in Malta, Domenic is most frequently seen alongside soccer pitches but somebody has to sit in the sun beside the pool with the pretty girls! The game is quite simple, seven players per side in the water at any one time, a goal at each end and a ball which is the size and weight of a soccer ball but rendered water proof and grippy for single-handed passing and throwing. The women's game is played with a slightly smaller ball. Lots of goals are usually scored, a total of 10 being about the norm.